The San Diego region’s first bus rapid transit, which planners view as almost as quick and comfortable as riding the trolley, begins Sunday on Interstate 15 between Escondido and downtown San Diego. Rapid buses will leave every 15 minutes during rush hours and every 30 minutes at other times, travel in the express lanes of I-15, and make only nine stops. Travel time to downtown will be about an hour. “In just a few days, San Diego will have a totally different way of traveling,” said Poway Mayor Don Higginson at a press conference introducing the new buses. 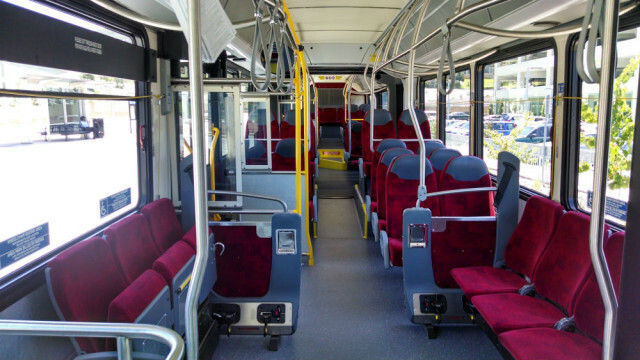 To kick off the service, MTS is offering free rides Sunday and celebrations open to the public at transit centers in Escondido, Rancho Bernardo, Sabre Springs and City Heights. MTS Chairman Harry Mathis said he believes the new service will appeal to San Diegans because of its comfort and speed. 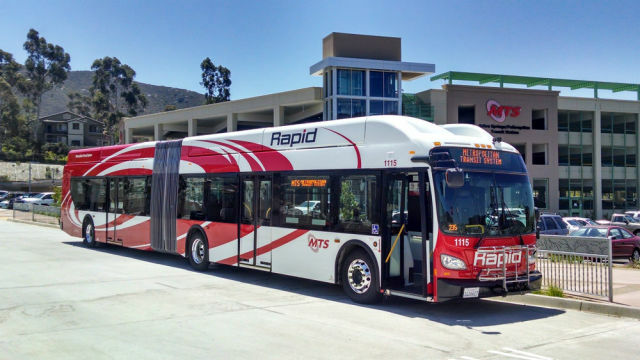 SANDAG, San Diego’s regional planning agency, and the MTS are planning to invest several hundred million dollars to build a bus rapid transit network. Three more routes are planned, including Rancho Bernardo to UC San Diego, San Diego State University through Mid-City to downtown, and Otay Mesa to downtown. Paul Jablonski, chief executive officer of the MTS, said bus rapid transit systems are being developed throughout the world as a lower-cost alternative to rail systems.